A strong cold front driven by a rather anomalous upper level low pressure system in Ontario will enable showers and thunderstorms to develop in the Northeast today. Given high temperatures and dew points some of these storms will be severe with a primary threat of heavy rain and gusty winds. Seasonable summer weather will follow Friday through the weekend. This morning's surface analysis over the Northeast shows a stationary boundary over Maine and a cold front trailing through Ontario, Western NY and Western PA.
One can see this on the 7 am temperature map. 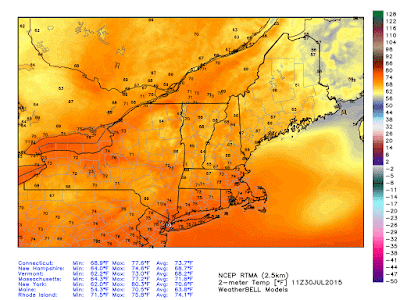 In downeast Maine temperatures are running in the upper 50's. For Southern New England the majority of us are well into the mid to upper 70's. Some showers and thunderstorms have already developed in New York. These may hold together as they approach the Hudson River and Western New England. In fact some high resolution short range guidance believes this not only holds together but actually strengthens it around 3-4 PM for parts of Central MA, CT, and RI. 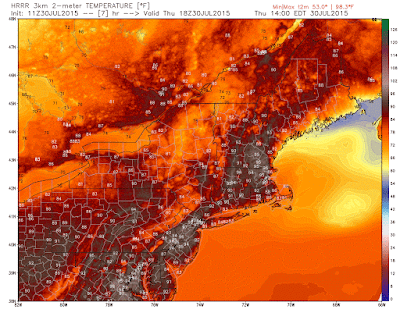 By 2 PM temperatures should be near or above 90 for most of Southern New England. For some this will be the 3rd day in a row of 90 + temperatures and thus a heat wave. 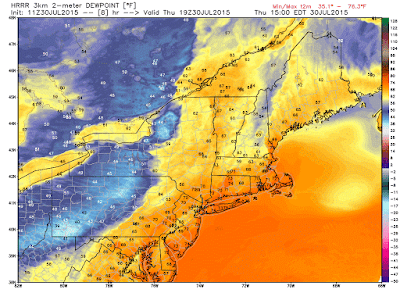 At 3 PM dew points are expected to be in the 70's. Look at how comfortable the air is behind this front however. 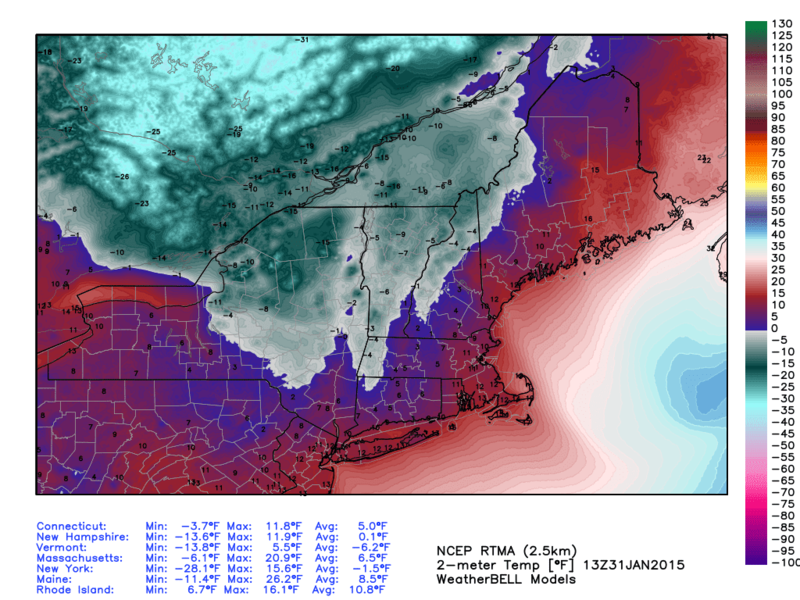 This is an incredibly tropical air mass for Southern New England standards. Of course just 6 months ago this is what the 8 am temperatures looked like. There was also 3 feet of snow on the ground and another blizzard about to impact the region so I'll take a few days of oppressive heat. 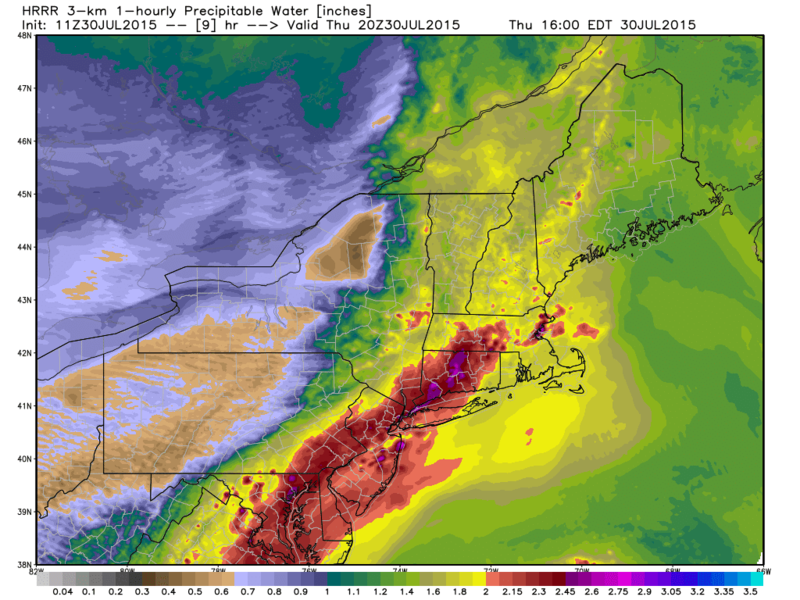 The amount of moisture available to any showers or thunderstorms that develop today is impressive. It is the biggest threat with any storms although gusty winds (low chance of a downburst due to tropical nature of atmosphere) and a brief tornado is possible (unlikely, but still a chance). A secondary round of showers and storms is likely for Western New England later this afternoon. I think these storms have the best chance to be severe. I will be watching throughout the day. It appears unlikely severe weather will hold together and reach SE MA. However the main weather headline for the Cape and Islands, as well as all South facing beaches, is building surf and rip currents. A small craft advisory is in effect for much of the MA/RI/CT shoreline and offshore waters. In other news the tropical Atlantic hurricane season continues to be slow. There are two areas that the National Hurricane Center is watching for possible development, but it gives each a 10% shot in the next 2 days, and only 30% in the next 5 of actually becoming a Tropical Depression/Storm. 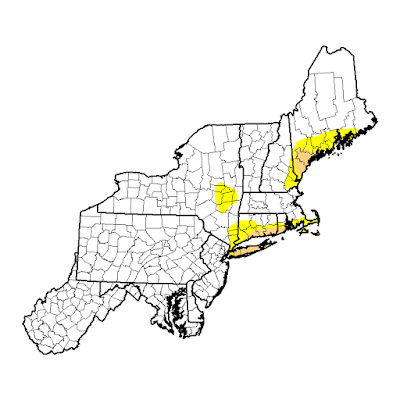 In other good news the drought that had intensified in May is all but gone from New England. It has been confined to the South Coast and Southern Maine. Today should put more of dent into these numbers but overall the next week looks mainly dry. Seasonable temperatures and dry weather will make it one of the best vacation weeks of the year. Finally there will be a full moon tomorrow, the second of July. That is somewhat rare and it is a called a Blue Moon. There will not be another Blue Moon for 3 years. Don't worry about that however. 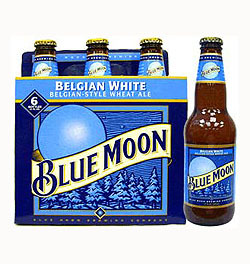 One can always find Blue Moon at the local package store. I prefer that type of Blue Moon over the astronomical one. That's all I've got for now. I'll talk to you if/when Severe Weather watches go up. The Storm Prediction Center in Norman, OK has issued a Severe Thunderstorm Watch until 11 PM for a significant portion of New England. The primary threat will be damaging winds, although hail up to 1" in diameter and isolated tornadoes are possible. The initial radar is rather quiet although there is a severe storm right now around Laconia, NH. South of the Mass Pike should be ok through early evening. 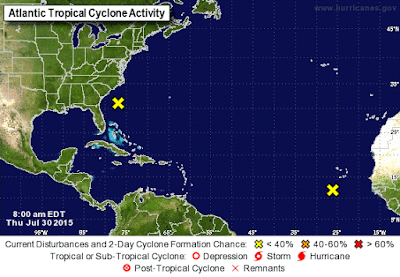 Activity may organize into a convective complex after dark. This complex would likely bring heavy rain and strong winds with it so keep tabs on the situation throughout the afternoon/evening. If anything major happens I will update my post.